The village of Chamarel represents a small settlement surrounded by big attractions. Kick off your visit on the 15th (Thu): admire nature's wide array of creatures at La Vanille Nature Park, admire the sheer force of Chamarel Waterfall, and then don't miss a visit to Seven Colored Earths. On the 16th (Fri), you'll have a packed day of sightseeing: explore the wealth of natural beauty at Black River Gorges National Park and then stop by Rhumerie de Chamarel. To see more things to do, reviews, ratings, and tourist information, read Chamarel trip itinerary planning site . Gaborone, Botswana to Chamarel is an approximately 7.5-hour combination of flight and car. You can also do a combination of car and flight. The time zone changes from Central African Time (CAT) to Mauritius Time (MUT), which is usually a 2 hour difference. Expect slightly colder evenings in Chamarel when traveling from Gaborone in November, with lows around 25°C. Wrap up your sightseeing on the 16th (Fri) early enough to drive to Grand Baie. Your day-by-day itinerary now includes Ile aux Cerfs. 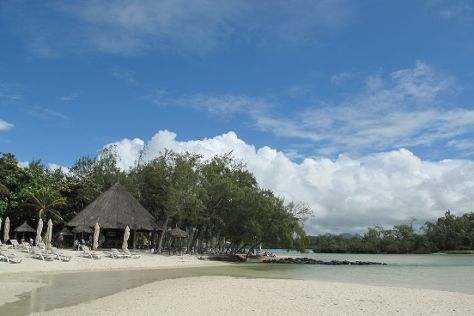 On the 17th (Sat), play a few rounds at Ile Aux Cerfs Golf Club and then enjoy the sand and surf at Ile aux Cerfs. For reviews, maps, other places to visit, and more tourist information, you can read our Beau Champ online trip itinerary builder . Traveling by car from Chamarel to Beau Champ takes 1.5 hours. In November, plan for daily highs up to 33°C, and evening lows to 25°C. Wrap up your sightseeing on the 17th (Sat) to allow time to drive to Grand Baie. Wide-open beaches with dazzling blue water and a relaxed coastal atmosphere lure visitors to take a trip to Grand Baie. Go for a jaunt from Grand Baie to Cap Malheureux to see Ile Plate Beach about 32 minutes away. The adventure continues: take in nature's colorful creations at SSR Botanic Garden, tour the pleasant surroundings at Pereybere Beach, kick back and relax at Balaclava Public Beach, and don't miss a visit to Notre Dame Auxiliatrice. Plan my day in Grand Baie using traveler tips and tourist information provided by Inspirock. Drive from Beau Champ to Grand Baie in an hour. Expect a daytime high around 32°C in November, and nighttime lows around 25°C. Finish up your sightseeing early on the 21st (Wed) so you can travel back home.